Beautifully appointed and cozy cabin in desirable Evergreen Valley! This wonderfully furnished cabin is just a short 1/4 mile hike to Suncadia Resort’s open space that runs along the Cle Elum River corridor. You’ll enjoy nature walks just out the front door to the river and Suncadia’s hiking & biking trails! The cabin also features access to the Roslyn Ridge Summer Pool Facility which is just a ½ mile drive away. Don’t miss out on a day in the water and sand at Speelyi Beach on Lake Cle Elum, just a mile and a half from the cabin. Owen's Outpost sleeps 9 comfortably and is equipped with free WiFi Internet! * Pet Friendly - Woof! The Great Room is a fantastic place to sit back and relax while enjoying your favorite movie or show. The room is accented by a river rock gas fireplace, soaring ceilings, and a hand crafted pine staircase. The large fire pit is just off the great room and offers fantastic wildlife viewing. You’ll often see Deer, Elk, and Wild Turkeys! The patio features comfortable outdoor furniture and a gas BBQ. Just a short 1.5 mile drive and you’ll be at the shores of Lake Cle Elum on Speelyi Beach! The lake offers all types of summer time activities, including swimming, boating, water-skiing, jet-skiing, and paddle boarding. Entrance to the Roslyn Ridge Activity Center is $7.50 person per day. The entrance fee is charged at the door (cash only). The Roslyn Ridge Activity Center is open between Memorial Day Weekend and Labor Day Weekend. It is also open on the two weekends following Labor Day weather permitting. The large, fully stocked kitchen comes supplied with all the utensils, pots, and pans to make fabulous in home meals. The dining table has seating for 4 with additional seating for 4 at the large kitchen bar. The King Master Suite features a private bath with a shower and there’s a 2nd guest bathroom just outside in the hallway from the 2nd King Bedroom. The large loft supports a Full over Full Bunk Bed with a pull-out Twin Trundle, and a private 1/2 bath. Fantastic location in Evergreen Valley. Mid-way between the lake and Roslyn. Just minutes to golf and other activities in Suncadia. Snowmobile or XC Ski from your front door! We loved our visit. The instructions were easy and the place was very clean. There was plenty of space for our party. We are happy to hear that you enjoyed your stay! Thank you for sharing your thoughts. Please let us know if we can be of assistance again in the future. Owens outpost was a cute clean place to stay! It was well equipped with linens and kitchen equipment! It was missing a propane tank for the grill! We had to go buy one! Other than that it was a lot of fun! Thank you for staying with us at Owen's Outpost, we appreciate it. Owen's Outpost is a great home and we are glad to hear that you all enjoyed your stay. Unfortunately, we didn't realize it was missing. You can always call our office and we could've run one out to you. Our office is only a few miles away. Thank you again for the nice review and please let us know if we can be of any future assistance for you. Cute cabin, well supplied, everyone had a great time! 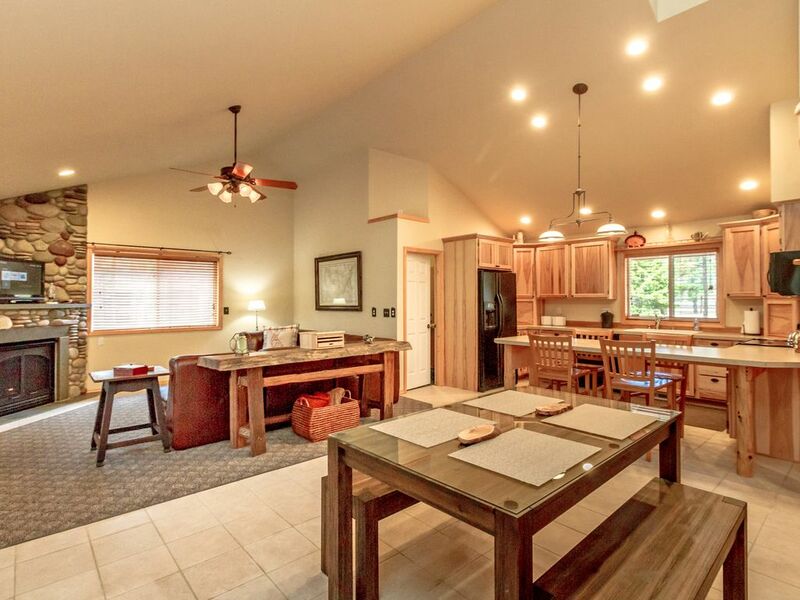 Cute cabin in a great location with easy access to Cle Elum, Roslyn and Suncadia activities. Well supplied. They left a nice basket for our dog with towels and little treats. Overall great experience! Highly recommend staying here on your vacation. Thank you for staying with us at Owen's Outpost, we appreciate it. Owen's Outpost is a great cabin and we are so glad to hear that you enjoyed your stay and the surrounding area. Thank you for the 5 star review too and please let us know if we can be of any future assistance for you! We had a very relaxing vacation and the amenities provided made it perfect. Our trip included two small children (3 & 1) and the house provided toys, snow, and a outdoor swing. It was endless fun for everyone at the house. We really enjoyed every moment we had at the house. Hi Sarah, Thank you for taking the time to let us and our readers know what you liked about Owen's Outpost, we appreciate it. Owen's Outpost is a great home and perfect for families with children. We are glad to hear that you all enjoyed your stay and thank you for the lovely 5 star review too. Please let us know if we may be of any future assistance for you! Thank you, All Seasons Vacation Rentals! My two young children and I spent 5 days/4 nights here and we loved it! We played games, did puzzles, played in the snow, went sledding and ice skating. We loved the house - my son even made the comment "Mom, how does this house have everything you need?" I will certainly stay here again! Great property! It was just perfect for a Thanksgiving getaway. Summer time access to the Roslyn Ridge Activity Center with a large outdoor pool, hot tub, kid's splash fountain, tennis court, basketball court, and sand volleyball!